UW Medicine, Seattle Children's Research Institute to provide licensed athletic trainers to treat, record concussions at Northwest Junior Football League games. 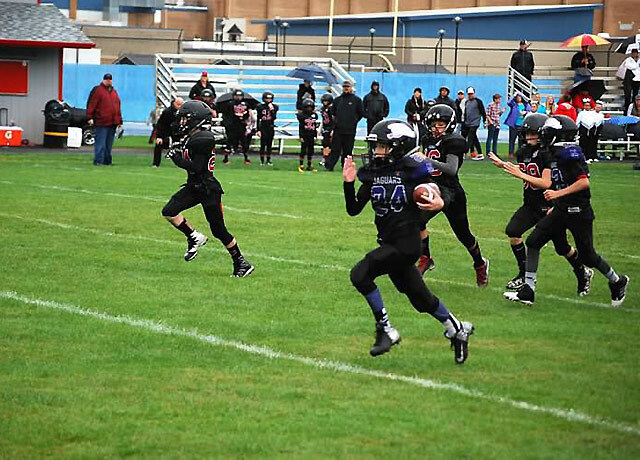 Players on the North Creek Jaguars sprint down the field during a 2016 game. League players are 6 to 14 years old. UW Medicine’s Sports Health and Safety Institute and Seattle Children’s Research Institute are partnering on a longitudinal study of concussions among players enrolled in the Northwest Junior Football League. The goal is to identify the proportion of grade-school and middle-school football players who sustain a concussion, as well as document the concussion’s effects and the factors that influence recovery and re-injury in players who have reported injuries. The researchers also will track how long it takes concussed youths to return to school, return to sports and return to the way they felt before the injury. Herring is co-leading the two-year study with Dr. Fred Rivara, professor of pediatrics at the University of Washington School of Medicine and an investigator at Seattle Children's Research Institute. Both are nationally recognized experts on head injuries in young athletes. During the 10-week 2016 season, researchers identified concussions among 5.9 percent of the 700 players, ages 7 to 14, who participated in the study. Study sponsors have paid for licensed athletic trainers from Seattle Children’s to be onsite at all league games and practices during the 2016 and 2017 seasons. In the fall of 2017, trainers will log more than 600 total hours. The trainers treat and record concussions, provide general injury care, and educate coaches and parents on topics such as head injuries, hydration and nutrition.